Porsche drivers doubled up around the globe this weekend, as Ahmad Al Harthy and Michael Caine took their second British GT win of the year at Zandvoort, in the Netherlands. Further south, Nicki Thiim doubled his 2013 Porsche Supercup victory tally in the seventh round at Monza, Italy. 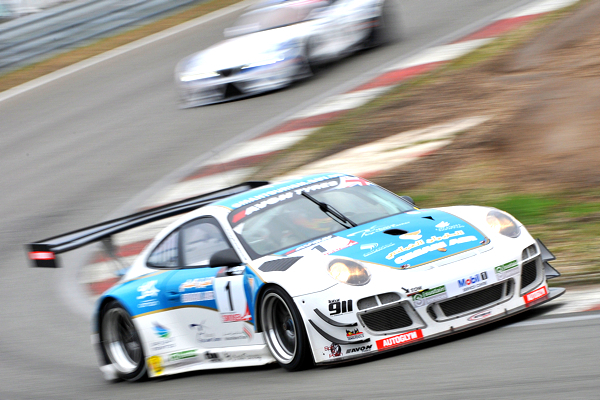 The Porsche 911 GT3 R of Oman Air Motorbase once again found itself on the top step of the rostrum at Zandvoort, during round six of the 2013 British GT Championship. The grids for the two-one hour races were decided during two qualifying sessions. In the first of the timed sessions, the ‘Amateur’ driver from each team would take to the circuit to set their fast laps. Motorbases’s Ahmad Al Harthy found the Zandvoort circuit to his liking, quickly acclimatising himself to a track he had not seen before the start of the weekend. Just before rain started to fall on the Dutch venue, Al Harthy set the fastest lap of the session, securing his first British GT pole in the process. With the Oman Air Porsche duo sharing the front row with fellow 997 GT3 R racers Nick Tandy and David Ashburn (of the Trackspeed concern) the first race looked like being a stern test for the Motorbase team. However, Al Harthy made the best start, leading the field into the first corner of Tarzan. By the end of the second lap, the challenge from Ashburn’s Porsche 911 had finished, as the 2010 champion deposited his GT3 R into the barriers at Hugenholz. The majority of Al Harthy’s stint was then spent under the safety car after a sizable accident amongst the midfield runners. As the green flag waved once more, the Omani driver just missed the opening of the pit window opening. Al Harthy and Caine celebrate their second win of the season. (Credit: PSP Images). As many his rivals switched over to their ‘Pro’ drivers, Al Harthy’s lead looked under threat. Thankfully, an incident in the pitlane delayed many competitors, allowing the Motorbase Porsche to return to the track with a six second advantage, with Michael Caine now at the wheel. The Porsche ace saw his lead whittled down by the chasing BMW of Dan Brown. Brown overtook the 911 at Tarzan with a few laps to go, only to see Caine slip back up the inside as the BMW ran wide. This squabble allowed Rob Barff’s Ferrari to move up into second. On the final lap, Caine was under yet more pressure, with the Ferrari all over the rear of his 911 GT3 R. Contact at Masterbocht curve unsettled Barff though, allowing the Motorbase team to take their second victory of the year. The second race of the weekend was not so successful for the Oman Air Porsche. After Caine qualified a disappointing 16th, the Porsche 997 GT3 R would start from 21st (after a five-place grid penalty incurred by Caine during free practice). Despite carrying 150kg of ballast, the Oman Air Motorbase pairing carved their way through the lower orders during the 60 minutes of racing to eventually finish ninth. Although Motorbase may not have managed to add a second victory to their weekend tally, a Porsche 911 still headed the field as the Trackspeed machine of Tandy and Ashburn comfortably led home the Barff/Gary Eastwood Ferrari. Al Harthy and Caine’s Dutch weekend continued their record of scoring in every race so far this season. With just the finale at Donington on 5th and 6th October remaining, the duo lie just 10.5 points off the championship lead. Nicki Thiim was “thrilled that we found our way back on the road to success” In the Porsche Supercup at Monza. His second win of the season ensured that the championship battle goes down to the wire in Abu Dhabi. The Dane resisted early pressure from Michael Ammermüller to reduce Sean Edwards’ championship lead to 18 points ahead of November’s Middle Eastern double-header. Monza proved a happy hunting ground for Nicki Thiim as he closed in on points leader, Sean Edwards. Kévin Estre took a fine third place, challenging Ammermüller in the closing stages on the long straights of the Monza circuit. Championship-leader, Sean Edwards finished fifth, after a poor start demoted him from third place. Edwards will go to Abu Dhabi with an 18-point lead over Thiim. Monza provided Total 911 ‘one to watch’ Ben Barker with a stern test in round seven of the Porsche Mobil 1 Supercup championship. The young Brit battled through to finish 12th after starting 18th.